Many states made great strides in implementing local reforms in 2009, despite the constraints of the recession and uncertainty about the impact of potential federal reforms. These innovations are documented in this year’s State of the States: The State We’re In. explored novel ways to re-think health care payment systems. 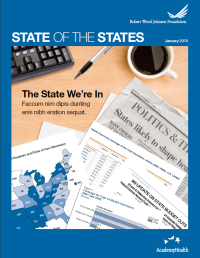 State of the States is an annual publication of State Coverage Initiatives. It is a detailed summary of state health policy reforms undertaken in the previous year. 2009's State of the States reviewed the full range of state activity on health reform during 2008 while also looking to the future, particularly in light of the expected impact of the economic downturn and the possibility of federal action. View past State of the States publications here. View Five-Year Timeline of State Coverage Strategies.